Dental Arts Academy is an energetic and dynamic young company. We specialize in the hands-on training for our dentists, on a national and international level. Dental Arts Academy has organized this type of course in the fields of endodontics, esthetic restoration and many others.With the help of many top-level lecturers from all around the world. We have 14 seats that are fully equipped with a Micro-scope, 3 way syringe, a turbine, and ultrasonic instrument. We have an X-ray and a CT which are fully equipped. After our lecturers show you the know-how by demonstration, you as a participant will be able to replicate and analyse the new practices with an X-ray and CT instantly. Each participant will be granted their own monitor, which has three different screen modes. The first one, or mode A is that they will have the same image from the main display, projected onto their own person ones. The second one, or the B mode, is that they will be allowed to see their microscope images, and the last one is, mode three or mode C. Which will allow the participants to check their X-ray and CT results whenever they want. All of this is right in front of them, so they are able to switch from one mode to the other as they choose. We will also provide a lounge are, where the lectures, participants and sponsors will be able to relax, talk and have a lovely lunch. Are you having trouble with removing the broken file inside of the narrow root canal? Ni-Ti files break mostly in narrow canals in the apical one third or curved canals because of the superelastic property. As new Ni-Ti files become more elastic, ironically they break in more hard-to-reach areas of the canals which make the file removal process even more difficult. In addition, the point of the root could easily infect and may happen the worst case to extract the tooth, because of the insufficient cleaning of the infected material adhering to the broken file. Dr.Terauchi has many years experience in removing broken file fallen into the narrow root canal, and the following movie is one example case. Finally, we are pleased to announce our Hands-On course on broken file removal are going to be held for English speaking dentists in May 2015! Since Dr. Terauchi has performed lectures and hands-on workshops on this particular subject even outside of the Japan including University of Pennsylvania, University of Minnesota, University of Toronto and other places. We have been receiving many requests from dentists all over the world to hold the course in English by Dr. Terauchi in Japan. Dental Arts Academy is proud to open the door for foreign dentists to hold a hands-on training course in Tokyo on 17th may, 2015 for the first time. 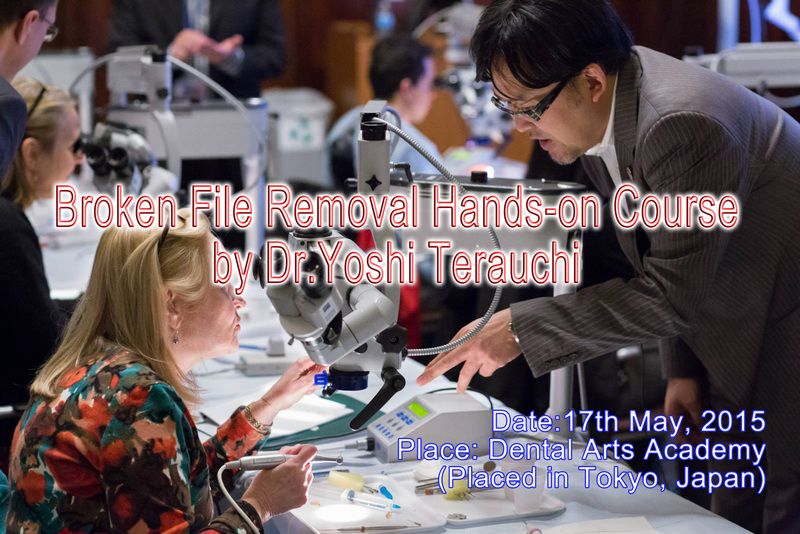 This broken file removal hands on course is going to give you tools and tips to remove the broken file easily, that are focused on removing various kinds of broken file by ultrasonic tips and the instrument originally developed by Dr.Terauchi. Theoretical sessions and practical instruction would be offered through the hands-on course, so that make you turn the knowledge into practice more effectively and productively. At present, out paying system is in preparation. If you want to apply, send us an E-mail(to:dentalartsacademyjp@gmail.com) including the information as below. When your information is confirmed, we would inform you about the payment as soon as it is ready. If needed, we would provide you the invitation for applying visa of Japan. If you are interested in or would like to participate this Broken File Removal hands-on course, please feel free to ask us by E-mail or Telephone! We will get back to you in 48 hours. The Payment would be PayPal.